Born in Amsterdam of Surinamese heritage, the 24 year-old is a product of the Ajax youth system, having developed with the youth squad from 1994-2004. He is a left-footed midfielder by choice, and a fairly capable and experienced left back, too. He also represented the Netherlands as a U-21 player, and was part of the squad who won the UEFA U-21 Championship in 2006. He was even named to the UEFA “Team of the Tournament” squad at the left back position. In August of 2006, Emanuelson debuted for the Oranje Senior National Team against the Republic of Ireland, and has since been capped 13 times. He was instrumental in helping the team to qualify for Euros 2008, but not called up for the tournament itself. He did, however represent the Netherlands in the 2008 Olympics in Beijing. In 2004, Emanuelson moved up from the youth squad to the Ajax senior team. He made his debut in the spring of 2005 and played with Ajax exclusively through his January transfer to Milan this year. In over 240 appearances with the club, he scored 22 goals. While with Ajax, they won the Dutch Cup in ’05-’06, ’06-’07 and again in ’09-’10. He was honored as the “Amsterdam Talent of the Year” in 2006, following his successes with both the U21 team and also Ajax. His ties with Milan before this year are interesting: in the ’08-’09 season, he was coached by Milan Legend Marco van Basten at Ajax. He also advertised his wares at the San Siro in December when Milan hosted Ajax in the Champions League. He had a solid game, assisting on at least 4 shot attempts and winning a number of free kicks as well. 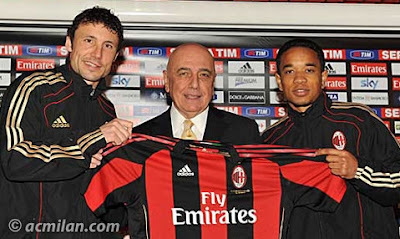 Maybe that’s when Galliani was sold, who knows. But we do know that he was signed to a contract through June of 2014 with Milan worth 1.7 million euros the very next month. His Milan debut was in the Coppa Italia vs. Sampdoria, where he assisted on a goal by Pato. His Serie A debut came against Catania as a sub. Allegri has primarily used him as a midfielder thus far, largely due to our midfielder shortage. We certainly could have used him in the Champions League, too, but he was cup-tied, obviously having played with Ajax earlier this season. He was given a run at left back when Milan played Napoli, subbed on for Jankulovski in the 72nd minute. With our left back position being our weakest spot all year, I think that many of us fans were hoping that Emanuelson would be our saving grace there. However, as Urby said himself when he came to the club, he prefers the attacking position. He played so much at left back at Ajax because it increased his chances at first team action, but he is better in the midfield. He doesn’t score a lot - maybe he comes from the Robinho school of thought, that it’s not his job to score, but he certainly knows how to cross & provide valuable assists, which we seem to be short on anyway. However, if Tassotti has anything to do with it, we might make a strong left back out of him after all. He has been criticized for being vulnerable in one-on-one situations in the defense, as well as his tendency to play too far forward, leaving the back vulnerable. However at either position, he exhibits great pace, stamina, and the ability to accelerate quickly, which is refreshing for Milan with our roster full of senators. And his crossing isn’t world class, necessarily, but it is better than so many of our other full backs, so I think Milan fans will find him more than acceptable. Perhaps Emanuelson is not going to be contending for the Ballon d’Or anytime soon. He is a relatively young, very good player, perfectly capable of earning and maintaining a first team position, even at a big club like AC Milan. But consider him amongst our stars: he works hard, has great character, values time with his family, and makes himself available for Allegri whenever and even wherever he is needed. He is happy and grateful to be at Milan, and is completely drama free. And did I mention he is loyal? Truly, who could ask for anything more of one of our newest Dutch imports? Some might consider his talents and these qualities as unremarkable, but in this day and age where players must be both seen and heard (as well as overpaid,) I find Urby Emanuelson very remarkable. Benvenuto al Milan, Urby!